Hint: It involves the passage of the largest affordable-housing bond in the city’s history, plus calls for cooperatives and community land trusts. The housing crisis in this country—with its half a million homeless people and its hundreds of thousands of annual evictions—continues to swell. Its sources are various: a real-estate lobby that relentlessly undermines rent regulation and other tenant protections; a right-wing federal government beholden to the wealthy and at war with public housing; a devastating financial collapse a decade ago; and an influx of international capital, tech bros, and mega-landlords into urban cores. Thanks to these forces and others like them, the United States currently contends with a shortage of more than 7 million deeply affordable housing units nationwide, and low-income renters everywhere are suffering for it. With their stratospheric rents and runaway gentrification, cities are the epicenter of this crisis—and for too long urban officials haven’t adequately addressed it. They haven’t managed to protect renters effectively or build enough deeply affordable new units. This, however, is finally beginning to change. Across the country, new local housing movements are pressing cities to start combating this scandalous status quo in creative ways. And many municipalities have responded in recent months with a slew of policies—taxes, bond initiatives, tough regulations—that promise to take a bite out of the housing crisis. In Seattle, for instance, the City Council last month shrugged off stiff opposition from corporate heavyweights like Amazon and Starbucks and unanimously passed a new tax on the city’s largest employers that will raise $47 million a year over five years to fund new affordable housing and services for homeless people. In Oakland, the progressive City Council member Rebecca Kaplan is pushing an aggressive proposal that would levy a tax on the city’s vacant properties and funnel the proceeds into new housing development and other measures to combat the affordability crisis. In both New York City and San Francisco, new initiatives guarantee legal counsel to every tenant who comes into housing court. And in Philadelphia, local officials have proposed a 1 percent tax on the cost of new construction in the city in order to fund affordable residential development. Then there’s Austin, Texas, where a coalition of progressive City Council members, socialist organizers, housing nonprofits, and other community groups have launched a grassroots effort to pass the largest affordable-housing bond in the city’s history. They want Austin officials to approve a bond initiative—to be voted on by local residents—that would provide $300 million to create new affordable units, finance public housing upgrades, and purchase a large swath of land to be used by the city for future housing development. The proposed bond’s comparatively bold dollar amount speaks to the severity of Austin’s housing woes. In this city of roughly 1 million residents, there is currently an affordable-housing shortage of nearly 50,000 rental units. Extremely low-income renters—people who make less than $20,000 a year—are the hardest hit by this housing dearth. They continue to struggle against eviction and displacement as an ongoing influx of new residents, many tied to the tech industry, reshapes the city. At the same time (and often as a result), Austin’s homelessness population is increasing: On any given night, more than 2,100 men, women and children are living on the city’s streets or in shelters. Austin officials have estimated that it will cost more than $6 billion to eliminate the city’s affordable housing shortage. And so organizers on the ground are calling on their local government to take determined action. The city’s 900-member-strong Democratic Socialists of America chapter is one key player in the coalition supporting the proposed housing bond. The group recently released a list of demands calling on Austin to use at least $100 million of the bond money to launch a large-scale public-land-acquisition program in order to take urban property out of the private market. 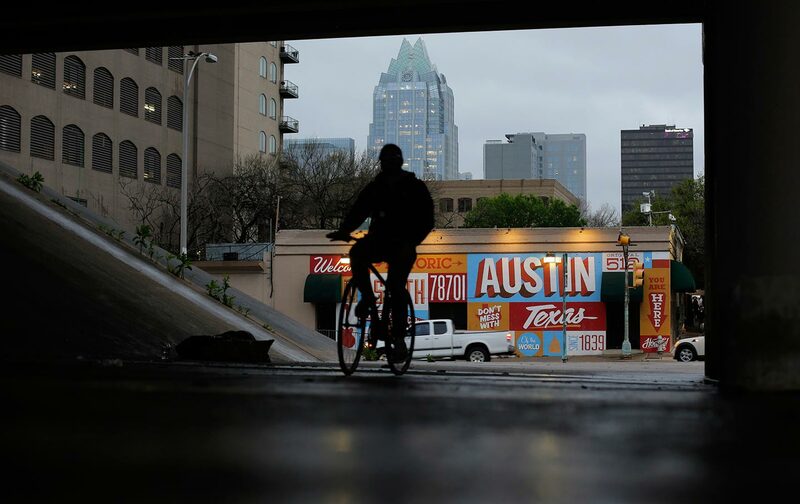 The group is also pressing Austin officials to use the bond to restore and maintain public housing and finance affordable cooperatives, community land trusts, and other noncommercial housing models in the city. It sees these demands as an initial step in restructuring Austin’s housing system. That’s an ambitious dream. At the moment, subsidized affordable housing makes up only about 7 percent of the city’s 380,000-unit housing stock, according to Casar’s office. This means it will take tens of thousands of new noncommercial units to come close to the vision that Nachbar put forward. It will also require long-term organizing and vibrant local movement building to accomplish such bold objectives, beginning with the bond proposal. Austin DSA and its allies, including racial- and economic-justice groups like the Austin Justice Coalition and the Workers Defense Action Fund, aim to create that sort of campaign. They are currently lobbying the City Council to approve the proposed bond and put it on the November 2018 ballot. Three council members, including Casar, already support the measure. If the measure passes the council, DSA plans to launch a canvassing drive to convince fellow Austinites to back the initiative at the ballot box. Indeed, as they build support for the bond, Austin’s housing activists are setting an example for others who wish to see a robust social-housing system in the United States. As The Nation recently reported, a rising tenants’ movement in this country is calling for the creation of new public and other noncommercial housing options to help combat the nationwide plague of exorbitant rents, evictions, and ubiquitous homelessness. Earlier this year, the People’s Policy Project released a headline-grabbing report that sought to articulate what such noncommercial housing might look like. Titled “Social Housing in the United States,” the report argues that this country ought to follow the European model and build nonmarket housing on a mass scale. Specifically, it calls for the creation of 10 million units of mixed-income, municipally owned housing in American cities over the next 10 years. The report recognizes that the current right-wing administration in Washington is unlikely to support this sort of social-democratic initiative in the near term, so it encourages local governments to take matters into their own hands. Austin’s bond proposal, with its grassroots origins and its promise of massive public-land acquisition and new funding for affordable housing, is a beginning. It offers a glimpse of what city-led social-housing initiatives might look like. Then again, even $300 million will not be enough. Bond advocates estimate that their proposal will be able to create, subsidize, or otherwise leverage between 7,000 and 8,000 units, depending on how the money is spent. That is only a small portion of the city’s nearly 50,000-unit affordable-housing shortage. In the end, if cities like Austin are going to eradicate the crisis, state and federal agencies will need to kick in more support. In this political climate, only a muscular national housing movement with a long-game strategy can make that happen.